Ok, ok, ok ... more on this precious baby later! Yesterday afternoon, I put all the things in my slow cooker to make taco soup & by dinner time it was SO good. 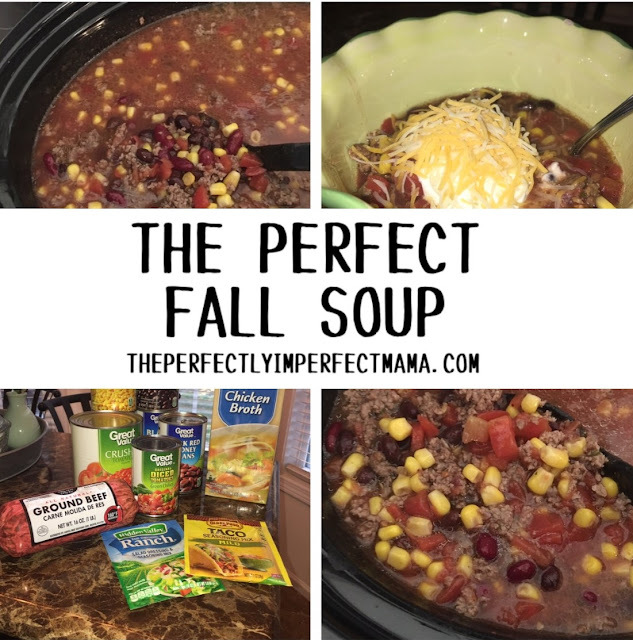 I get all the happy feels when it's Fall & there is a delicious soup in my slow cooker! Add all your ingredients to your slow cooker. I actually don't add my hamburger meat until about 30 minutes before we are ready to eat. I brown it & then add it. I don't drain anything off of each can only because I think it gives it extra taste. Plus the cup of chicken broth gives it flavor too! Stir it all up & let it cook on high for 3-4 hours. After I add the hamburger meat, I cut down to low until we are ready to eat. I have used shredded chicken before too & it was good! Top with sour cream, your choice of cheese & enjoy! This is one of my all time favorites, y'all!! And what's dinner without a yummy dessert!?! I wish I could share with you an amazing homemade chocolate chip recipe but these are Tollhouse.😉 But if you have a recipe please share!